PST3 Cymbal Pack 14" High Hats 16" Crash 20" Ride Series Description: ..
B8X Performance Plus Pack The evolution of B8 - with more hammering - including fully hammere..
SBR Performance Pack Pure brass cymbals with a great look and sound. 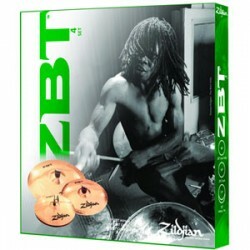 14" Hats, 16&qu..
ZBT 5-cymbal pack The ZBT 5 Cymbal Set features a bright, intense sound that cuts through the..
ZBT ROCK 4 Start Here. Go Anywhere. Great sound and a great value. Our time-proven workhorse l..